Review posted May 11, 2014. Frances Lincoln Children’s Books, 2013. 32 pages. Here’s a picture book that begs to be read aloud. It’s set in Africa during a drought. All the animals are hungry. They find a tree covered in red, ripe fruit smelling of sweetest mangoes, fat as melons, and juicy as pomegranates. But there is an enormous python twined around the trunk of the tree, holding the branches out of reach. He will only move if they can tell him the name of the tree. And only Lion, the King of the Jungle knows the name of the tree. One by one, the animals go and ask Lion the name of the tree. One by one, the animals forget on the way back. Finally, tortoise goes slowly and carefully and makes a song of the name of the tree. 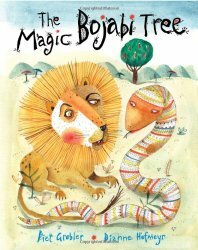 This story has plenty of fun in the animals’ attempts to remember “Bojabi” – “Bongani”? “Munjani”? And of course tortoise’s chant will be one that will entice children to join in.